With Call Of Duty still very much absent from the Nintendo Switch, one publisher has swooped in on a Helo, bringing some much welcomed first-person, shooting mayhem. Move over Activision, Gameloft is here to do what you would not with their Console exclusive title, Modern Combat Blackout on Nintendo Switch. Gameloft is very well known for their success in the mobile game market. They have been developing and publishing mobile games since the early 2000’s. Of course, it helps when the founder of the company also co-founded Ubisoft. This has allowed the company to use their top IP’s, like Tom Clancy’s Splinter Cell, Assassin’s Creed and helped to create some of their own, including Asphalt and Modern Combat. Modern Combat is a series of first-person shooter military games available on iOS and Android. There are 5 main games and a couple of spin-off titles in the series. 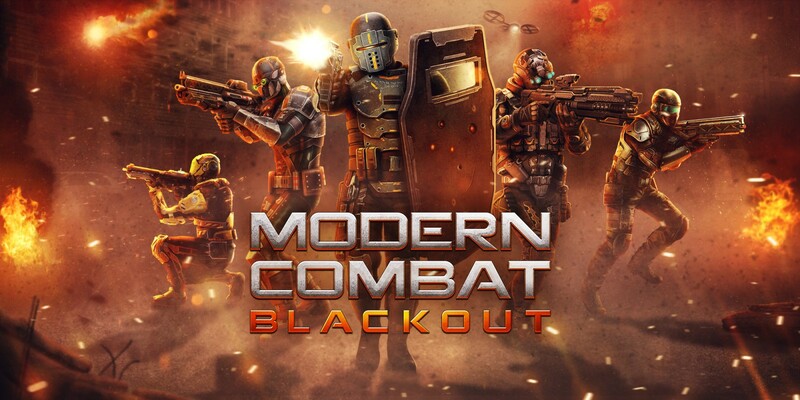 Modern Combat Blackout on Switch is a ported version of Modern Combat 5: Blackout, which released in 2014. You are put in the shoes of Cayden Phoenix, A freelance military contractor working for Gilman Security. After your colleague Jonathan “Bull” Taylor is dismissed for suspicion for being involved in illegal arms deals, Phoenix begins to suspect that Gilman Security main not be so clean cut themselves. Following a number of blackmail threats on his daughter’s life, Phoenix decided not to investigate further into the shady dealings of Gilman Security. However, upon waking up in an impromptu hospital in the Rinnōji Temple after surviving an explosion, Phoenix is forced to put an end to Gilman Security and their collaboration with the terrorist group, the World Liberation Army. Unlike most current first-person shooters where their single player Campaign and online multiplayer are separate from each other, Modern Combat 5 integrates both modes by sharing a single progression system. This allows experience earned in one mode to carry over to the other and vice versa. It also allows players to unlock weapons and equipment that are not restricted to either mode. Players can also unlock soldier classes like Recon, Assault, Heavy, Sniper, Support among others. Though you are restricted to what weapons you can use in each class, you can customize them with many different attachments. Regardless of Class, you can still pick up any weapon you find in the battlefield. Just bear in mind that if you get killed, you will only respawn with the Loadout you choose and will lose the weapon you just picked up, much like any other FPS game. Single player campaign missions can be played offline and consist of over 40 missions including the main story and Special Ops missions. Each level is around 2-5 minutes long, which is ideal for those with only a short amount of time. As with most games of this calibre, there are loot boxes to be purchased in order to get customizable gear. Fortunately, this is all done with in-game currency which can be earned by doing missions, multiplayer or levelling up. There are three types of Multiplayer Modes to choose from. Four if you count the multiplayer missions in the Campaign mode, There is the competitive Soldiers League, where you climb the League ranks for season rewards against random players. Non-Ranked Custom Match allows players to set-up their own custom deathmatch with its own parameters. Local Multiplayer enables players to set up multiplayer matches via Local wireless. In both Non-Ranked Custom Match and Local Multiplayer, you can tweak the parameters to your preference. You can limit weapon tiers, soldier classes, grenades or military support. You can also choose which stage you want to play on as well. Multiplayer matches can be played solo or in teams. You can also form your own squads of six with five of your friends. You can either create your own squad ou join your friend’s squad. You can only be in one squad at a time so if you want to join another, you will have to leave the one you are in first. Like with most shooters, ZL is to aim down sights and ZR is to fire your weapon. You can reload your primary weapon with B and change to your secondary weapon with X. The A button is used to crouch or do a power slide whilst sprinting. The L button allows you to use military support if available. You can also throw grenades with R. If you push the Right Joystick in, you can execute a melee attack but it only works when up close to enemies. You can move around with the left Joystick and aim your weapon with the right Joystick. If aiming down sights, you can use the gyroscopic controls to aim more freely. If auto-sprint is deactivated, you can sprint by pushing in the Left joystick. Modern Combat Blackout is a very visually compelling game and looks incredible on the Nintendo Switch. Though there are other FPS games that are much more realistic to look at, on Switch, there are not that many with the exceptions of Doom and Wolfenstein that look as good as this game. While it is a port of a mobile game first and foremost, that hasn’t limited the resolution in any way. Even in docked mode, the visuals are sharp with perhaps a little blurriness in the background. The audio effects are very good. The music and sound effects are sharp and impactful. The voice acting is well done to the point that you would think this was a proper Call of Duty game, as opposed to a Mobile title getting a console upgrade. Modern Combat Blackout is a very well done Call Of Duty substitute for those looking for a hard-hitting COD style game on the Switch. However, it does have a number of issues that make it far from perfect. The game has crashed on me on a number of occasions. Sometimes during my playthrough in the campaign mode and usually after completing a mission. It has crashed a couple of times after multiplayer matches as well, though fortunately, it has yet to happen during a multiplayer match. It is a small issue but an issue nonetheless as when it crashes, it doesn’t always save progress so you have to do the mission again. I also found that the character is quite slow to move as well or rather not as fast as I would have expect. Sprinting doesn’t seem to be much faster either and could have done with being just a tad faster. I have found that the online multiplayer matches have been reasonably stable. I have hardly noticed any lag and gameplay can be quite fierce at times. There are other moments where if only two of you playing, you may be lucky to spot each other once during a match. On the other hand, when up to 12 players are in a match, it can make for some quite exciting matches. Modern Combat Blackout is a fine example of First-Person shooters that utilises the Nintendo Switch’s functions and can provide a solid multiplayer deathmatch. The visuals are great, the gameplay is compelling, especially with other players. The online multiplayer mode is stable and the single progression system between both single player campaign and multiplayer ensures that players play both modes. It might not be Call Of Duty but I think it does a much better job and should certainly be in everyone’s Switch library, for $19.99 it is quite a lot of bang for your buck and the many types of customization and weapon unlocks will keep players entertained for quite a while.